can you tell what is different about today's photography?! hint: THE KITCHEN. yes! 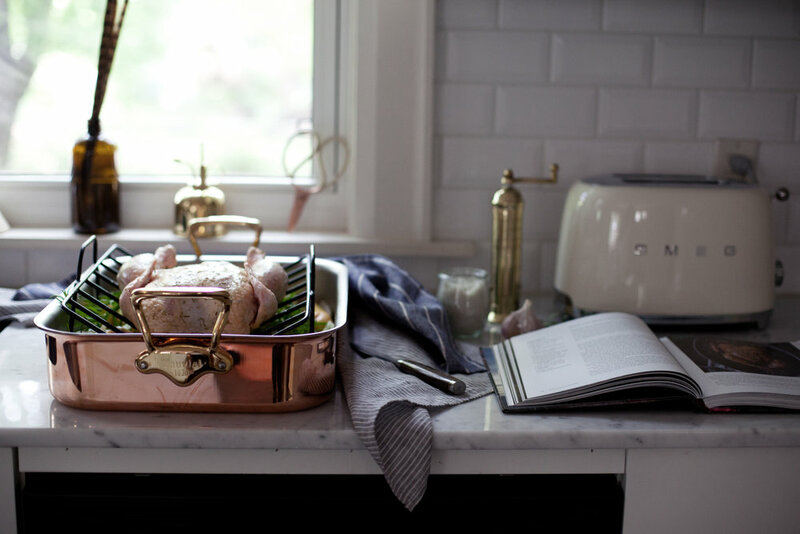 this was my first shoot in my brand new kitchen & what a better way to break it in than creating a chicken recipe from eva kosmas flores' new cookbook adventures in chicken which is released in stores TODAY! she is the amazing author & photographer behind one of my favourite food blogs adventures in cooking. everything she makes is a perfect mix of elegant & rustic. to anyone who knows me personally, they know i am obsessed with chicken. i eat it literally every single day (seriously though, every single day) so i am quite excited to have 150 recipes dedicated to my favourite food. in a large bowl whisk together the chicken stock, maple syrup, vinegar, salt & thyme. add the whole chicken in a large zip lock bag & coat with marinade. let sit in the fridge for 4 hours or overnight. remove chicken from marinade bag & place in desired roasting pan. in a small bowl mix together the dry rub of maple sugar, 3/4 teaspoon salt, dried rosemary, & black pepper. spread generously over the chicken. in a separate small mixing bowl add the maple syrup, 3/4 teaspoon salt, diced bacon, sweet onion & olive oil. 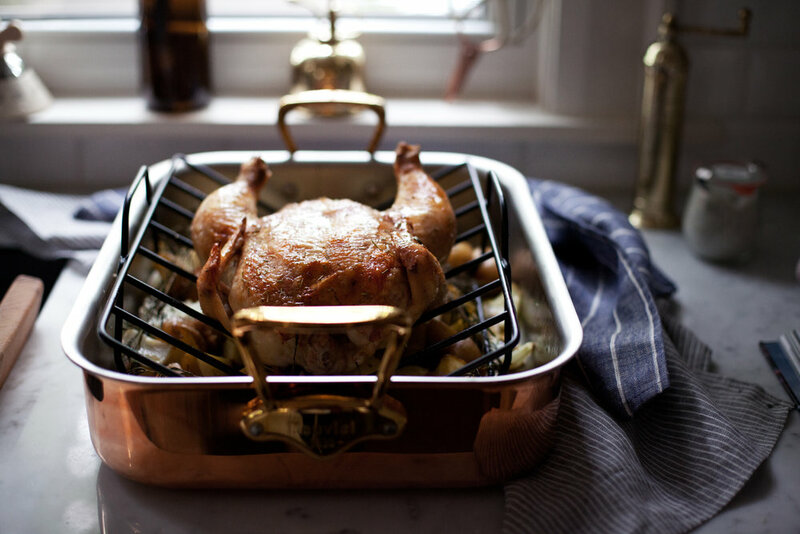 toss over the chicken & into the roasting pan. with the two left over strips of bacon, stuff them under the skin of the breast. place rosemary in the bird cavity & arrange some in the roasting pan. fill the roasting pan two inches high with the chicken stock. tent tightly with foil & bake for 1 hour. remove foil & cook for an additional 15-30 minutes. 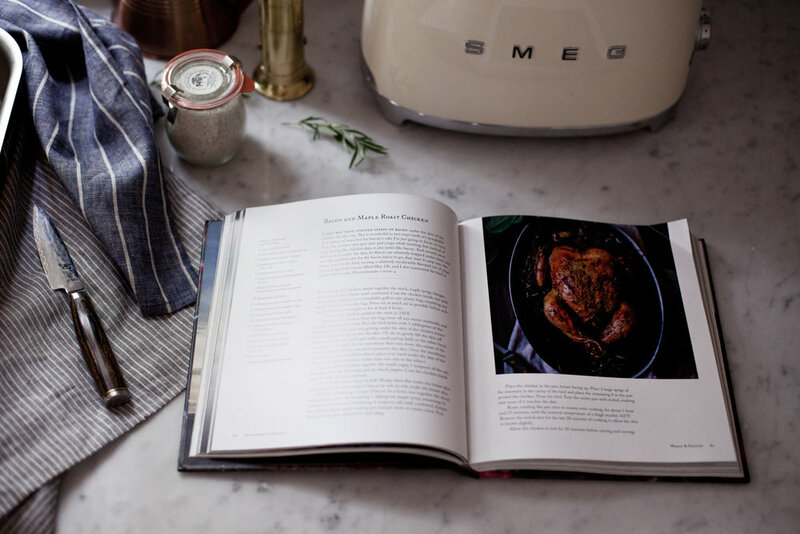 for 150 more amazing chicken recipes, check out eva kosmas flores (of the blog adventures in cooking) first cookbook adventures in chicken which is released today! you can order it on amazon here.